Posts about random topics whenever the mood strikes. Q: When should you change your ukulele's strings? A: When you won't need to play it for 10 days! It's been said that all jokes have a basis in fact. This one is no exception. New strings can stretch for up to 10 days. You'll find yourself retuning almost every time you pick up the instrument (and sometimes while you're still holding the instrument) until the strings settle in. This is NOT due to a fault in the strings or the instrument. It's the way new strings behave. Do NOT tug on the 3rd string (the thickest one). Make it as snug as you can without raising its pitch before tightening. Finally, if you play in GCEA, tune the uke to ADF#B. Both the uke and the strings should be designed to handle the increased tension. The strings will slip but keep at it, checking every so often. You'll retune. The strings will keep slipping. That's okay. The idea is to get them to the point where they don't slip below GCEA. Make a final ADF#B tuning before going to bed. In the morning, the strings will have slipped a bit but will go into GCEA just fine. (As a further demonstration of the perversity of nylon/flurocarbon/nylgut strings, when the strings are dropped into GCEA, they will remember that they were tuned higher. They will go out of tune sharp(!) for a short time until they settle in for real. That part about going to bed is another way of saying let the uke sit for a bit. I've used this technique to restring a uke in the morning and take it to a jam in the late afternoon. Eventually, you should be able to, too, but see (1) above. Don't press too hard the first few times you try this. With practice, you'll figure out the right amount of tugging needed. Something like this technique may work for concert and tenor ukes, but I have no real experience with them except for the occasional concert uke. So, I'm afraid you're on your own here. What key should I sing that song in? While not uniquely a ukulele issue, the question often arises about the key a song should be sung in. The answer is not complicated, but it requires a critical piece of information What is the highest note that you can sing? as close or equal to the highest note you can sing, but no higher! For example, the highest note I can sing comfortably is D above middle C. Now, we need a song. How about "By The Light Of The Silvery Moon"? The song is written in the key of C.
F is the fourth note in the C major scale (C-D-E-F), so...whatever key I sing the song in, the highest note will be the fourth note of the scale. Since D is the highest note I can sing, I look for the key in which the fourth note of the scale is D.
I'd begin by seeing how the song works in the key of A. If the highest note is a passing note, I might be able to choose my key based on the second highest note. If a song lives near its highest note, that is, most of the notes are high or there is a long passage of high note, I might have to pitch the song in a lower key (G or F). Oh, those wonderful *%)!# diminished chords! As a hobbyist guitar player, whenever I came across a diminished chord I'd skip it. Six strings and a chord that requires 4 fingers in a cramped position is something I did not need, thank you. That said, the sound of the diminished chord is really nice. A ukulele has but four strings and the position isn't that bad when there are only four strings. While there are many ways to form the same chord, it's easy to argue that there are only 3 diminished chords, all of the same shape but on different frets. Each one of the diminished chords can be named by any of the four notes in it. So, for example, (0,1,0,1) contains the notes G, C#, E, Bb so it can be called Gdim, C#dim, Edim, Bbdim. What could be simpler? But, if it's so simple, why can't I remember it?! Notice that the diminished chord repeats itself every three frets. That is, if (f,f+1,f,f+1) is a particular diminished chord, then so is (f+3,f+4,f+3,f+4), where 'f' is a certain fret number. Leaving the C and A out of the fretboard diagram was a breakthrough of sorts for me. Like most ukulele players, I've drilled it into myself that the ukulele is tuned gCEA, so, when looking for a C, I automatically think of the open third string. However, that doesn't work for diminished chords because there is no way to fret the first and third strings below the nut! 'C' is first string, third fret. Similarly, 'A' is fourth string, second fret. It is no accident that 'C' and 'A' are emboldened in the table. Oh, those wonderful 9 chords! As an amateur guitar player, I didn't have much use for 9 chords. However, they sound wonderful and become surprisingly manageable on a ukulele with its four strings. 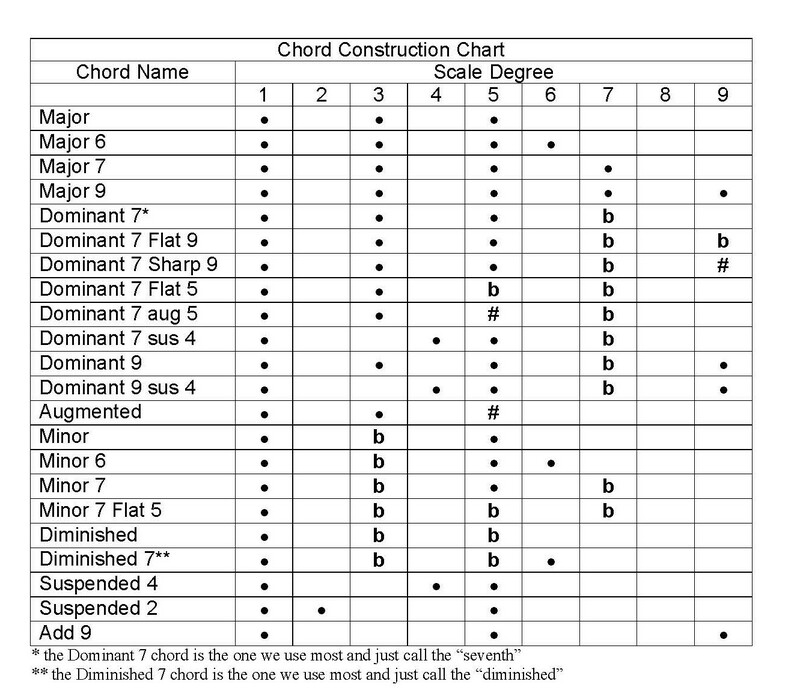 If you check the chord building chart from the "Chords, and how to make them" note, you'll see that a 9 chord is just a 7-th chord with the 9-th note of the scale added. Think '2', but an octave higher. Bb: the 7 chord is (1,2,1,1). The 9 note is C. There is a C on the third fret of the first string, making the Bb9 (1,2,1,3)...which makes it sound a lot harder than it is! Keep the bar! That is, finger the Bb7 the usual way by using the index finger as a bar across all four strings and your middle finger fretting the second fret of the third string. Add your ring finger to the third fret of the first string and you've got it! This is a moveable chord. For example, when you move your index finger one fret up the neck to (2,3,2,4) and you've got B9! D: the 7 chord is (2,2,2,3). The 9 note is E. There is an E to be found on the third string, fourth fret, making the D9 (2,4,2,3)...which makes it sound a lot harder than it is! If you finger your D7 by using your index finger as a bar on the 2-nd fret and your middle finger at the 3-rd fret of the first string, then all you need do is add your ring finger at the 4-th of the third string. This is a moveable chord. For example, when you move your index finger down the neck and let the nut take its place, you have C9=(0,2,1,0). E: the 7 chord is (1,2,0,2). The 9 note is F#. There is an E to be found on the second string, second fret, making the D9 (1,2,2,2), which again can sound a lot harder than it is! Two ways to obtain the E9 are by using four finger tips and by barring the first three strings at the second fret with the middle finer, say, and arching the index finger to fret the fourth string. However, since the E9 has the first three strings fretted at the second fret, it doesn't matter what is done with them on the first fret. So, a what some find as a much easier way to form the E9 is by barring all of the strings across the first fret with the middle finder and all four strings across the first fret with the ring finger. This, too, is a moveable chord. There are a few downsides. While I have not seen the program's source code, it is my sense that it recreates an index of song titles every time it is started. I am also guessing that it sorts the titles into alphabetical order and does it in an inefficient manner. I have more than 9,000 (nine thousand; not a typo) chordpro files. Songbook takes so long on to start on my tablets that it is easy to think that the program has frozen. As I type this, I realize that I don't like the inherent ambiguity in the phrase "so long", so I grabbed my older Asus MeMo ME301T and newer Samsung Tab A. It took 75 seconds for a list of song titles to appear on the MeMo and 70 seconds on the Tab A. The other is for people like me who prefer to store song files in a directory structure rather than create playlists. Songbook for Android supports only one level of subdirectories. For example, if your chordpro files were stored in a directory called ChordPro, that directory could be subdivided into Rock, Pop, and Jazz, say, but Songbook would not be happy if Rock were subdivided into 60s, 70s, and so on. SongBook costs $8 for Android, $19 for PC ($17 if you already own Android), $8 for iOS, $18 for Mac. Thus begins a series of occasional posts describing some of the best software for ukulele players. There's no better program to start with than ChordSmith. It's written in Java, so it will run on any platform that supports Java. It performs a bunch of tasks that can be found in other programs. It can convert lead sheets in two line text format (one line chords, the line lyrics) to Chordpro. It also converts Chordpro to two line text. I can be used to edit song files. WAKE UP! I know it sounds boring because so many other programs do the same thing. However, ChordSmith has a batch mode! It can transform hundreds of files in the blink of an eye. If you've never faced this problem, then ChordSmith is probably not of interest. Other programs edit, transpose, and change format quite nicely (stay tuned for Songbook). However, over many years back in the last millennium, I created a collection of 200+ songs from Tin Pan Alley that I enjoy. I wanted to be able to use them on my tablets with apps that requires Chordpro format. The thought of transforming them one at a time was distressing, not because I couldn't do it, but because I could! I could, but it would be an arduous task. Google led me to ChordSmith, which accomplished the task in minutes, including the time it took to download the software. ChordSmith is giftware. I sent a gift. I had to. If I didn't, I'd still be feeling guilty about how much work it saved me. I don't use ChordSmith as much now, but there are still occasions where it's the right tool for the job. For example, I might create a set of songsheets by cutting and pasting them in two line format from the Ultimate Guitar Archive. Then, I used ChordSmith to convert them to Chordpro format. However, for onezies and maybe twozies, I'll use other tools, including my modification of the Uke Geeks' Song-a-Matic editor. My modification retains any blank lines that appear in the songsheet file. The original Song-a-Matic strips them, which I find makes their resulting Chordpro file difficult to read.